The island with Europe's last feudal system has voted against completely abolishing the role of landowners in its government. After an extraordinary meeting of Sark's parliament, the Chief Pleas, it agreed to reduce the number instead. Landowners will now be reserved 14 seats in the Chief Pleas, with the total number of seats on the body reduced from 52 to 28. The other 14 seats will be made up of elected people's deputies. The public will also vote to decide which landowners are given seats. The current set-up is that the legislature gives all 40 landowning tenants an automatic seat in Chief Pleas, with a further 12 seats for elected Deputies. The measures were approved by 25 votes to 15 and the move follows European human rights laws which mean Sark can no longer be run in the same way. Sir David and Sir Frederick Barclay, who live on the nearby island of Brecqhou, petitioned the Queen's Privy Council that the current system breaches EU human rights laws. 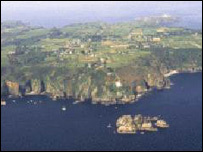 That was rejected but the Sark government was told to rethink its plans. Some doubt remains whether the Privy Council will approve Wednesday's changes as having gone far enough. But Sark's Seneschal, Reg Guille, said Chief Pleas are prepared to defend their decision in the European courts and a fund is being started to cover legal costs.